Bachelor Ben Higgins just ruined the finale. 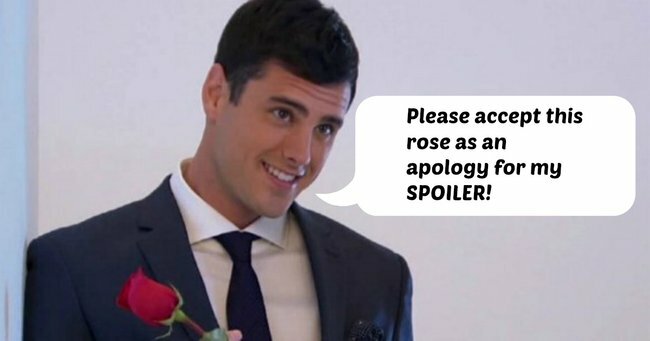 US Bachelor Ben Higgins just spoiled the finale for half the country. US Bachelor Ben Higgins just committed a cardinal social-media sin, by publicly, and without adequate spoiler warning, revealing the winner of this season of The Bachelor before half the country have seen the show. “Watch this beautiful woman and I on @JimmyKimmel,” he posted. ‘This beautiful woman’ being Lauren. The Winner. Whoops. Due to the cross-country time difference, viewers on the West Coast had not yet seen the show. They were quick to metaphorically lynch chastise Higgins for his blunder. Some angry fans have suggested that Higgins’ brain fade might be further proof that he isn’t in the right frame of mind. They’re not happy with his choice of lady-love. Poor bugger was just too excited to tell the world about his new fiance.